The Chinese media coverage of US Chair of the Joint Chiefs of Staff Adm. Mike Mullen’s visit to China reveals a lot about the sources of hope and fear in the military relationship between the United States and China. The hope lies in the unsurprising diplomatic effectiveness of face to face interactions between professional military personnel. Clips of Mullen’s comments to Chinese reporters outside a PLA command and control facility aired hundreds of times on Chinese Central Television (CCTV) news broadcasts. 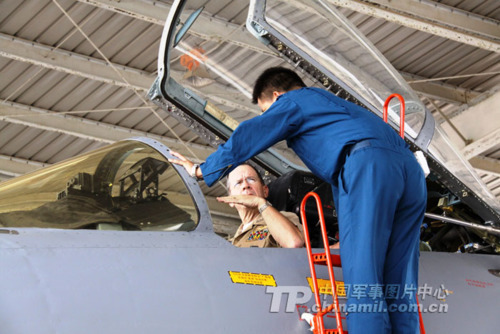 They showed a happy, relaxed US military commander praising the “professionalism” and “openness” of the Chinese troops. Those are reassuring images and statements certain to undermine the influence of some of the hypernationalist nonsense from the Chinese blogosphere that creeps into the public debate. The reporters’ questions were in response to Chinese interference with Vietnamese and Philippine efforts to begin tapping suspected oil reserves in disputed waters in the South China Sea. The United States claims increased U.S. naval exercises in the area are justified by the need to maintain freedom of navigation. Chen correctly noted there has been no interference with rights of passage, and then went on to say that US concerns about freedom of navigation were “an excuse” for “stirring up trouble” in the region. Chinese officials rarely confront their guests so directly, especially in front of a bank of television cameras. I’ve sat down to have informal chats with a few uniformed Chinese military officers in my day. Chen was every bit as blunt on national television as I would have expected if I was sitting alone with him in his living room. But he was also respectful. He wasn’t beating up on Adm. Mullen, trying to embarrass him, or spouting propaganda. He was just letting him know how the Chinese military felt about the issues. It was an extraordinary performance. If the conversations were as candid in private, then these meetings are well worth the time and effort. Televised comments from the PLA foreign office official escorting Mullen were equally encouraging. His tone of voice suggested genuine frustration when he mentioned “frank discussions of places where we disagree.” But he followed that by noting it was useful to “expose conflicting views” and “demonstrate a willingness to make the effort to resolve things through dialog.” These are very important messages for the Chinese public to hear, especially in the gruff voice of a military officer in what at least appeared to be unrehearsed comments from a secret military base that Chinese reporters noted, with some frustration, Mullen was shown even though they were not allowed to enter or even name. Mullen also visited a Chinese air force facility, a CSS-7 mobile missile brigade, and a submarine base. I felt like I was watching a Chinese version of Oliver Stone. A lot of the anxiety in the US intelligence community, and among our own talking heads, is a product of paying too much attention to Chinese academic “experts” like Song. Mullen noted that the two militaries are just beginning to get to know each other, but that he is “confident in the future of the military to military relationship.” It will be interesting to see if his comments to our allies, to Congress and to the American media about his China visit are just as positive and reassuring.